Every woman longs for, and deserves a place to store her most valued treasures. This beautiful hand-crafted jewelry box is designed to provide ample space to accommodate her favorite necklaces, earrings, bracelets, rings, chains, and other keep sakes. Its sturdy wooden structure, brass fixtures, and velvet lining will protect her jewelry for decades to come. 5/8" x 9 3/4" x 14 1/4"
1/4" x 8 1/2" x 13 1/2"
5/8" x 7 1/4" x 14 1/4"
5/8" x 7 1/4" x 9 3/4"
5/8" x 1 11/16" x 11 9/16"
3/8" x 1 3/4" x 11 9/16"
3/8" x 1 3/4" x 9"
1/4" x 8" x 10 13/16"
3/16" x 1 1/2" x 10 13/16"
13/16" x 1 1/2" x 8"
3/16" x 1" x 13"
3/16" x 1" x 3 1/8"
1/8" x 5/16" x 5 1/2"
5/16' x 2" x 2"
Scale Front C to the drawing dimension size. This can be accomplished by measuring the print out of the project and dividing that size into the dimension size shown on the drawing, or listed in the Bill of Materials. This will give a “Multi-Factor” that can be used to figure the enlargement size for the pattern. The same multi-factor can be used to determine the enlargements for the other shape E.
Use a planer to plane lumber to the various thicknesses required. Use a jointer to joint the edges of all lumber. Use a table saw and a radial arm saw to cut all lumber slightly larger than the dimensions called for on the materials list. Trace patterns onto front (C) and sides (E). Use a scroll saw to cut out shapes for front (C) and sides (E). Use a spindle sander to sand the shapes for front (C) and sides (E). 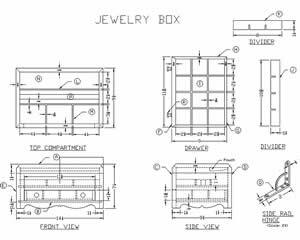 Draw a 1 3/4" x 11 5/8" drawer opening shape in front (C). Drill a 1/4" hole in the center and insert a scroll saw blade in the hole and carefully cut out the opening. Use a table saw to cut 1/4" x 1/4" dado joints across the inside of each side (E), 1 1/16" and 3 7/16" from the bottom of the wooden jewelry box for the bottom (B) and top compartment bottom (N). Cut the bottom (B) and top compartment bottom (N) to proper sizes. Use a miter saw to cut the left and right edges of front (C), back (D), and sides (E) to 45 degree angles. Use a miter saw to cut the top edges of front (C), back (D), and sides (E) to 45 degree angles. Cut a 45 degree spline groove into the side edges of the front, rear, and sides to a depth of 5/16". Also cut all edges of top (A) to 45 degree angles. NOTE: This step should be completed after the front, rear, and sides have been assembled in order to get a perfect fit. Cut the splines (O) to proper sizes. Use a table saw to rip the drawer front (F), back (G), and sides (H) to 1 5/8" wide and then joint them to 1 11/16". NOTE: The drawer front should be 5/8" thick and the back and sides should be 3/8" thick. Use a table saw to cut 3/16" x 1/4" rabbet joints on the inside bottom edges of the drawer front (F), back (G), and sides (H). Miter the edges of the drawer back (G), and the rear edges of the drawer sides (H) to 45 degrees. Miter the edges of the drawer front (F) to 60 degrees, and the front edges of the drawer sides (H) to 30 degrees. Drill two holes for the drawer pulls (R). They should be drilled 2" from the left and right sides of the drawer front (F). Also bevel the holes on the inside of the drawer front so that the flathead screws will fit flush. Cut the drawer bottom (I) to fit after the drawer front, back, and sides have been assembled. Cut the horizontal and vertical drawer dividers (J) and (K) respectively to properly fit the inside of the drawer after the drawer has been assembled. Cut the top compartment dividers (L) and (M) to properly fit the inside of the jewelry box after it has been assembled. After the jewelry box has been assembled, use a hand router and a 1" reverse ogee bit to route the design on all four corners of the top (A). Also, after the jewelry box has been assembled, use a band saw to cut off the top portion of the box 1 1/2" from the top to form the lid. NOTE: Be sure to clamp a fence 1 1/2" from the blade so that an accurate cut can be made. Use a shaper and a 5/16" straight router bit to cut the gains in the jewelry box for the side rail hinges (Q). The gains should be 1/8" deep x 2" long. Also use a drill and a 1/4" drill bit to drill two holes 1 1/4" deep into the jewelry box. These holes should be drilled in the hinge gain area, 1" in from the back on each side to allow space for the hinge straps when the top is closed. Note: Hand sand all parts with the appropriate grit paper that are too small to sand with the orbital sander. Place glue on all mitered edges of the front (C), back (D), and sides (E). Place glue on the splines (O) and position them in the splines grooves. Place glue in the slots cut for the bottom (B), and top compartment bottom (N) and position them in their appropriate slots. Assemble the front (C), back (D), and sides (E) into place and clamp together with two small band clamps. Clean up excess glue and allow to dry for 24 hours. Glue top compartment dividers (L) and (M) into position. Place glue on the mitered edges of the drawer front (F), drawer back (G), and drawer sides (H) and clamp them together with a small band clamp. NOTE: Make sure the drawer is square. Turn the drawer up side down and place a small bead of glue in the rabbet joints and position the drawer bottom (I) into place. Use a brad nailer with 1/2" brads to secure the drawer bottom. Glue the drawer dividers (J) and (K) into place inside the drawer. Place glue on the top mitered edges of front (C), back (D), and sides (E). Also place glue on all four mitered edges of the top (A) and clamp in place with wooden hand screw clamps. Refer to the cutting procedure step #21 to chamfer the top corners. 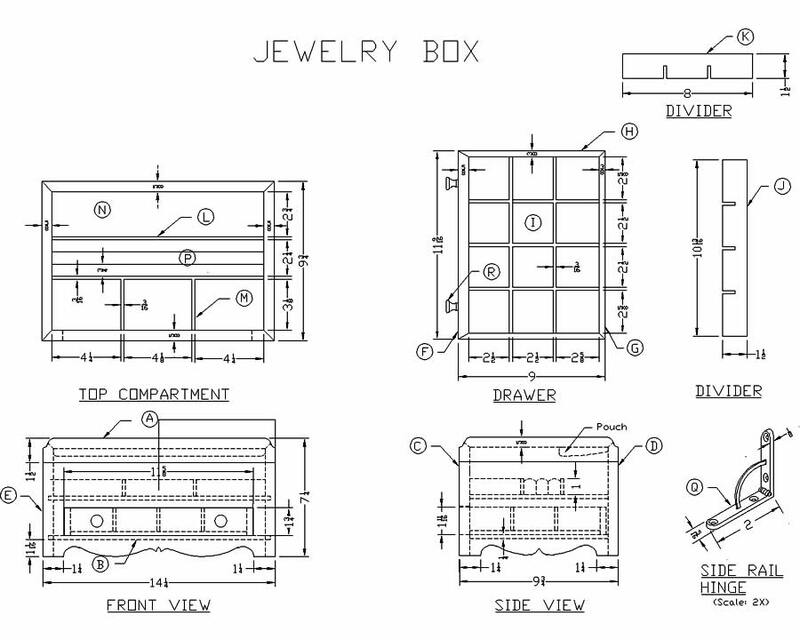 Refer to the cutting procedure step #22 to cut off the top of the jewelry box. Use plastic wood dough to fill any openings or imperfections, and then hand sand all parts with 220 grit sandpaper. Be sure to remove all dust. If you want to stain the jewelry box this is the time, in order to prevent getting any stain on the velvet liner material. NOTE: Do not stain any areas of the jewelry box where the velvet liner material will be attached. Attach the two drawer pulls (R). This must be performed now so the flathead screws will be covered with the velvet liner material (T). Cut the self-adhesive velvet liner material (T), remove the plastic backing material and place the velvet on the insides of the lid, top compartments, and the drawer. Also attach the velvet to the drawer dividers (J) and (K). Use and exacto knife to cut the excess velvet from the slotted areas of the dividers. Use a small roller to burnish the velvet so it will stick securely. Place the drawer dividers (J) and (K) in the drawer. Cover the foam ring bar material (P) with velvet and glue into place in the top compartment. Cut a piece of velvet liner material 8" x 16" to form a pouch for the inside of the lid. With a sewing machine, zig zag stitch the left and right sides of the velvet to prevent fraying. Fold the velvet in half lengthwise, with the right side of material inside. Stitch a 1/2" seam along the raw lengthwise edge. Turn fabric right side out. Next, make a 1/2" pocket by stitching a straight line 1/2" below the lengthwise fold. Insert a 13" long piece of 1/4" elastic (U) into the pocket area, securing it on both ends with more zig zag stitching. Turn both short ends under 1/2" and place a small bead of glue on the inside of bottom and each side of the pouch. Staple fabric to the inside of the lid with a staple gun. Screw the pendant hooks (S) in a row on the inside of the lid. The pendant hooks and pouch will hold the necklaces and chains in place when the lid is closed. Attach the side rail hinges (Q). NOTE: The hinges should be attached after the finish procedure is complete. Allow final coat to dry 24 hours before using your wooden jewelry box.